This week is a sort of diary taking in Mother’s Day, new boots and more right here in Eleuthera and further afield. 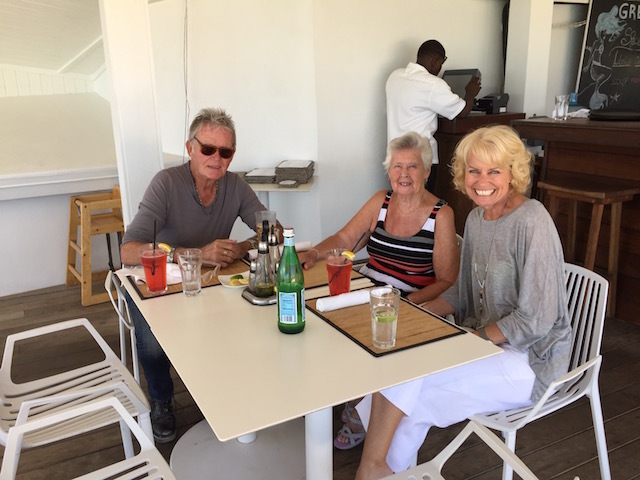 Mother’s Day was a glorious sunny day – as most of the days here are and we decided to take a drive north and treat my Mum to lunch at The Cove. Oh what a delight – great food – I had sushi – thank you very much ! The deck outside was nicely busy – plenty of visitors enjoying themselves eating lunch as well as a few taking advantage of the beautiful beach to swim, paddle board and kayak – is that right ? is kayak a verb ? – I don’t think so – anyway you get my drift ! The staff are always so friendly and helpful and the standards remain as high as when Sidney was there. Many of you know of my involvement with the Exceptional Learners and the new boots story is about a former student there. Kevin left the school three years ago and has not had anything to do – as is the case with many of the students who leave. Anyway – when we started work on the apartments we are building for the Governors Estate rental pool down in the settlement – Kevin, who lives opposite the site, used to wander over to see what was going on. He is a big chap – 6’6″ – we measured him ! and as strong as an ox. So Bob – being the sort of chap he is decided to let Kevin help out. From him randomly appearing and wandering off in the early stages he has now become a reliable addition to our team. 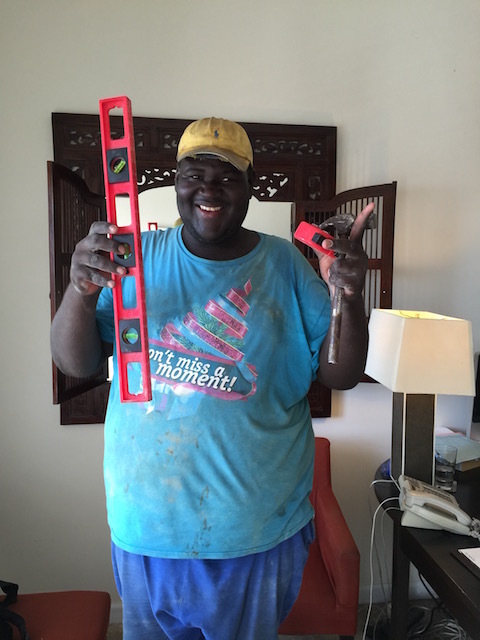 Kevin with tape measure, hammer and level – ready to work ….. The guys we employ on the sites have taken him under their wing and are very caring and compassionate with him. Early on Bob gave him a measuring tape, then a level and a hammer – which he always brings to work with him. We were delighted to discover that he is numerate – reading the tape measure better than some of our other workers ! Not quite sure what this means – is it a new gang sign ? – Bob Colman’s gang ? He has flourished with having a purpose to get up every day – and is certainly fitter and slimmer than he was before. As I said – he is a big chap – and he had only a pair of open sandals or Crocs with holes in the bottom. he started to ask us for some boots and after finding out that he wore a size 14 – extra wide fitting ! – it became apparent that I would have to buy them online for him. They arrived on Monday and we now have a properly shod worker ! 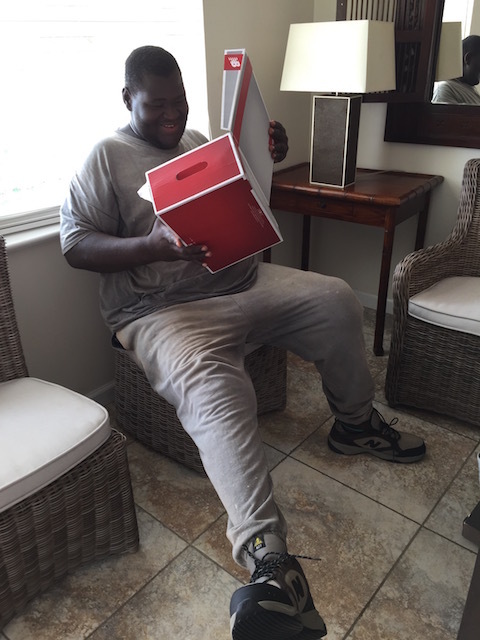 He is delighted with them – but now needs socks – which I am picking up for him while I am in Ft Lauderdale for more dental work. Kevin with new boots ! Actually I had an unexpected reprieve from the dental work as my dentist was picked for jury service and had to cancel my appointment. As always I decided to go for a nice meal the night before just in case I couldn’t eat the next day and I tried out a new recommendation from some of our lovely renters. 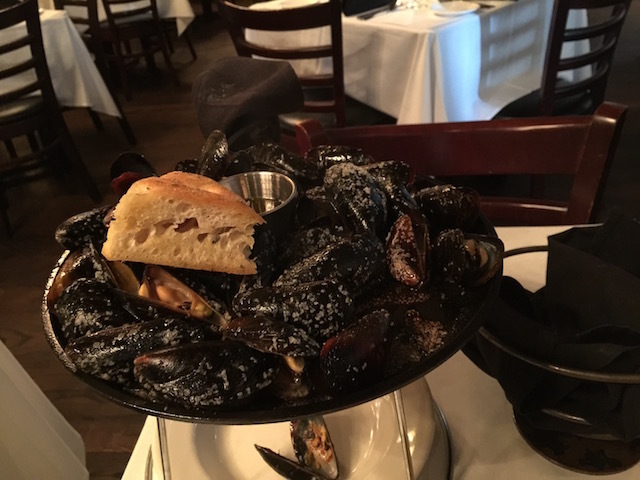 Timpano on Las Olas Blvd is famous for it’s mussels and clams so I treated myself to the Black Skillet Roasted Mussels with olive oil and sea salt – served with melted divine unsalted butter to dip them in ! – so good …. They come from Prince Edward Island and were plump, juicy and full of flavor. Next time I may have the clams and the mussels if Bob is with me to share ! Thank you to Frank and Rhonda Regueyra for their top tip ….. It is always good to share your knowledge – especially for restaurants ! 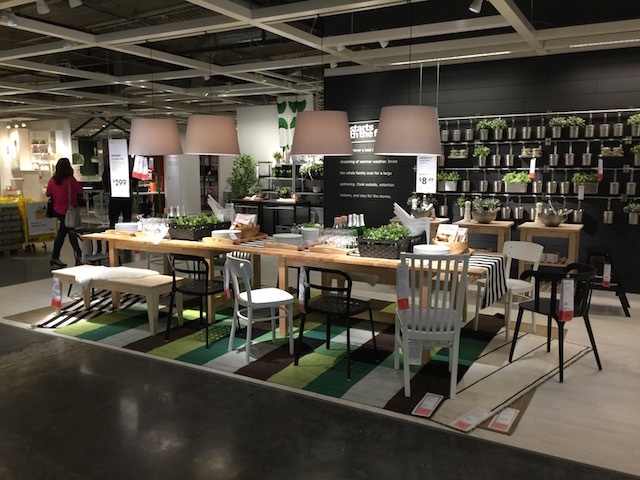 No trip to FL is complete without a trip to Ikea ! Not everyone who has been successful in material terms recognizes the implicit obligation to help others. This sets you and Mr. Colman apart. Thank you so much. It doesn’t take much to make a difference in many people’s lives. We have had great kindness and thoughtfulness shown to us at difficult times in our lives – and you don’t forget it. So it is lovely to be able to help others in turn….. Thank you Dennis – kindest regards to both you and Mary…. 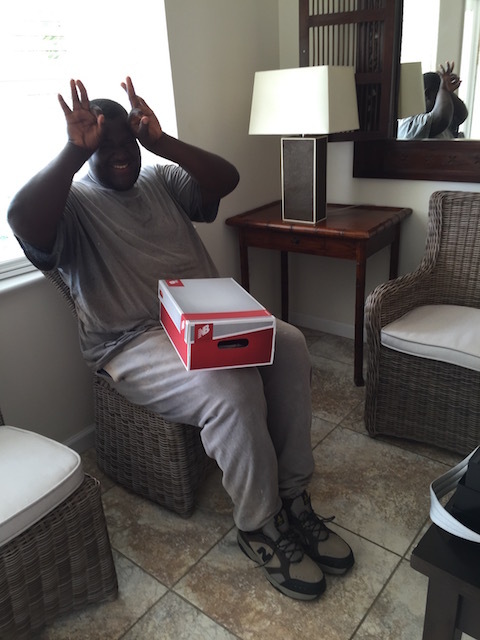 Thank you and Bob for your kindness to Kevin and all the other Bahamians you work with. Real kindness is a rare thing these days, especially in the US, and it is always easier to look away when you see someone in need. We saw Kevin approach Bob on our last trip, and he was so shy that he wouldn’t hardly speak at all. Now he is learning skills, and more importantly, confidence, that will help him for the rest of his life. You, Bob, and Kevin are the kind of people that we have so enjoyed meeting in Eleuthera. How lovely to hear from you – thank you for your kind comments. Hope to see you soon…. 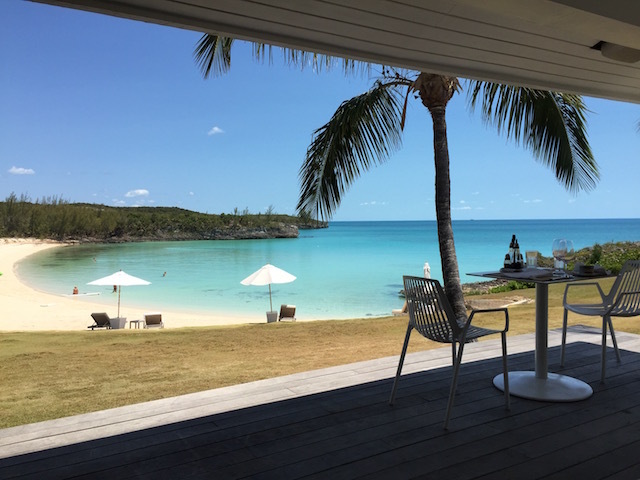 Another wonderful “Best of Eleuthera” post! I love these wonderful updates. I always learn something new. So nice to know that you are reading the posts ! See you soon….. I love that you are helping people, giving them work and with their needs. This is a sign of true compassion!!!! Wish you well and all the best. If we all do a small thing it has a ripple on the pond effect…… Thank you for you kind remarks. I remember Kevin. He would often be in the park in town near the orange food wagon. He would help the owner set it up. He was friendly and we started to talk on a regular basis as I made my food order there. I think you did a smart thing. Helping others to improve their lives is even more rewarding to the giver. BTW I love mussels but never had them that way. That little tip is now in my note list as well.